We need your vote. European democracy and integration need a vote of young people. Youth employment, youth work and the situation of youth in the EU were at the heart of a Citizens’ Dialogue in Ljubljana. A lively debate with young people, mainly youth workers and volunteers focused on concerns over unstable jobs for young people, on the recognition of informal qualifications and the value of youth work, the need to modernise education systems and the need to do more for an active engagement of youth in decision-making processes. The Citizens’ Dialogue in Ljubljana was part of a full day, open event entirely devoted to youth, youth employment and the active participation of youth in society. Several youth NGOs from Slovenia have joined forces and carried out youth empowering projects, backed with EU funds, to help young people gain skills, enter the labour market, open their own business and make their voice heard. Asked about the main challenges for youth in the EU, the Commissioner replied that unemployment remains a major issue in a fast changing labour market. The education systems need to adapt to ensure that young people develop digital and entrepreneurial skills that employers are looking for. Investing in growth, jobs and education is a priority for this Comission, and therefore the EC has proposed to double the budget for Erasmus+ in the next 7 year financial period as well as to increase the investments in research and innovation. Commissioner Navracsics explained that the Commission keeps a regular dialogue with many grass-root youth organisations on the EU level, and it promotes engagement on the local level. However, the EU does not have influence over the organization of the political systems by Member States. 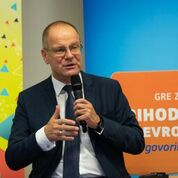 He encouraged the audience to be active and do the most to convince peers to go to vote, also at the next European election in 2019. One participant expressed his concern that Erasmus+ and the European Solidarity Corps were mainly attracting university students but failed to reach out to young people with a lower education. The Commissioner replied he wanted to encourage and enable more young people to step out of their comfort zone with an Erasmus experience, and the program has been reformed to include more young people of different backgrounds.